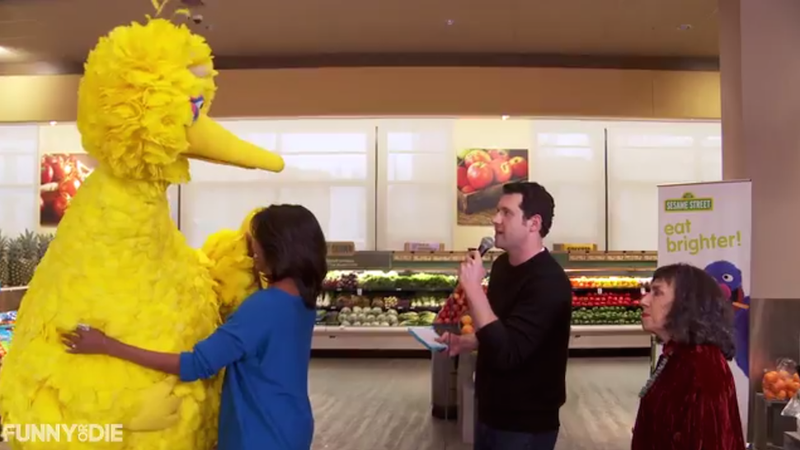 Billy Eichner managed to snag Michelle Obama for an episode of Billy On The Street, this time taking place in a supermarket to bring attention to her Eat Brighter! campaign. FLOTUS was joined by Big Bird—to whom Billy remarked: "You're like Jane Lynch, you're enormous! "—and Billy On The Street fan favorite Elena, who hasn't been in a supermarket "in about 10 years" and didn't believe the person next to her was actually Michelle Obama. "You're not like an actress being Michelle Obama?" Elena asked. "I love Michelle Obama," she told Michelle Obama. "Eat your vegetables," FLOTUS reminded viewers at the end of the segment. "Well, you can eat lots of other stuff, too," added Elena.